Married Name before September 1918 As of before September 1918,her married name was Jeffries. Agnes Marie (?) married Homer Minott Jeffries, son of Wilbur Jeffries and Nellie (? ), before September 1918. Agnes Marie (?) died in April 1955. Name Variation Margaret J. Jenewein was also known as Margarette. Married Name 15 September 1877 As of 15 September 1877,her married name was Davies. Margaret J. Jenewein was born on 14 October 1855 at Illinois also reported as Wisconsin. She was the daughter of John Jenewein and Maria Witmann. Margaret J. Jenewein married David T. Davies, son of Thomas David Davies and Susannah M. Thomas, on 15 September 1877 at Sauk, Wisconsin. Margaret J. Jenewein died on 8 November 1923 at Sauk, Wisconsin, at age 68. Margaret J. Jenewein had 9 with 9 living in 1900 children. She had 9 with 9 living in 1910 children. [S248] U.S. Federal Census 1860 U.S. Federal Census, by Ancestry.com, Page 38. Dwelling 285. [S246] U.S. Federal Census 1880 U.S. Federal Census, by Ancestry.com, NA Film Number T9-1446 Page Number 97B. [S245] U.S. Federal Census 1900 U.S. Federal Census, by Ancestry.com, Year: 1900; Census Place: Spring Green, Sauk, Wisconsin; Roll: T623_1816; Page: 13A; Enumeration District: 145. Grace Jenewein was born on 25 August 1896 at Wisconsin. She was the daughter of William Jenewein and Maria Magli. 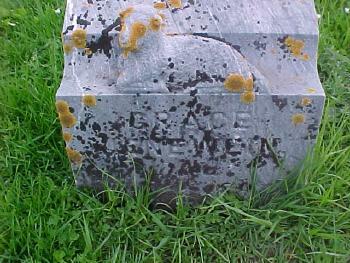 Grace Jenewein was buried after June 1900 at Pleasant Hill Cemetery, Franklin, Sauk, Wisconsin. [S245] U.S. Federal Census 1900 U.S. Federal Census, by Ancestry.com, ED134. Dwelling 55. Name Variation Rose L. Jenewein was also known as Jenewine. Married Name circa 1915 As of circa 1915,her married name was Bethke. Rose L. Jenewein was born in September 1894 at Wisconsin. Rose L. Jenewein married Louis Byron Bethke, son of Charles E. Bethke and Emma Stevens, circa 1915. Rose L. Jenewein died on 15 December 1965 at Wisconsin at age 71. [S244] U.S. Federal Census 1910 U.S. Federal Census, by Ancestry.com, ED114. Dwelling 173. [S250] U.S. Federal Census 1930 U.S. Federal Census, by Ancestry.com, Year: 1930; Census Place: Delton, Sauk, Wisconsin; Roll: 2609; Page: 1A; Enumeration District: 0010; Image: 64.0; FHL microfilm: 2342343. William Jenewein was born on 19 December 1890 at Wisconsin. He was the son of William Jenewein and Maria Magli. William Jenewein married Irva H. (?) before June 1917. William Jenewein died in April 1981 at age 90. 1 June 1905 Franklin, Sauk, Wisconsin William Jenewein is listed as nephew on the census of 1 June 1905 in the household of John W. Claridge at Franklin, Sauk, Wisconsin. William Jenewein obtained US Social Security Card at Wisconsin; last residence Prairie Du Sac, Sauk, Wisconsin; last benefit Sauk City, Sauk, Wisconsin. On 5 June 1917 at World War I Draft Registration, Sauk, Wisconsin, reported wife and baby. [S243] U.S. Federal Census 1920 U.S. Federal Census, by Ancestry.com, ED179. Dwelling 69. George Jenewein was born on 13 August 1886 at Wisconsin. George Jenewein married unknown (?) before June 1917. George Jenewein and unknown (?) were divorced before 1920. George Jenewein died in October 1973 at age 87. 1 June 1905 Troy, Sauk, Wisconsin George Jenewein appeared on the census of 1 June 1905 at Troy, Sauk, Wisconsin, listed as hired help with the George C. Gasner family. George Jenewein obtained US Social Security Card at Wisconsin; last residence Reedsburg, Sauk, Wisconsin. On 5 June 1917 at World War I Draft Registration, Lafayette, Wisconsin. In September 1930 at Sauk, Wisconsin, 76th birthday celebration. [S243] U.S. Federal Census 1920 U.S. Federal Census, by Ancestry.com, ED157. Dwelling 40. John W. Jenewein was born on 18 July 1884 at Franklin, Sauk, Wisconsin, SSN reported birth as 18 Jul 1883. John W. Jenewein married Gertrude (?) circa 1907. John W. Jenewein died on 2 March 1979 at Reedsburg, Sauk, Wisconsin, at age 94 John Jenewein obituary. 1 June 1905 Franklin, Sauk, Wisconsin John W. Jenewein appeared on the census of 1 June 1905 at Franklin, Sauk, Wisconsin, listed as a lodger with the John A. Hutter family. John W. Jenewein obtained US Social Security Card at Wisconsin; last residence Reedsburg, Sauk, Wisconsin; last benefit Baraboo, Sauk, Wisconsin. On 12 September 1918 at World War I Draft Registration, Sauk, Wisconsin. [S244] U.S. Federal Census 1910 U.S. Federal Census, by Ancestry.com, ED127. Dwelling 46. Married Name before June 1917 As of before June 1917,her married name was Jenewein. Unknown (?) married George Jenewein, son of William Jenewein and Maria Magli, before June 1917. Unknown (?) and George Jenewein were divorced before 1920. Irva H. (?) was born circa 1891 at Wisconsin. She married William Jenewein, son of William Jenewein and Maria Magli, before June 1917. Married Name circa 1907 As of circa 1907,her married name was Jenewein. Gertrude (?) was born circa 1886 at Wisconsin. She married John W. Jenewein, son of William Jenewein and Maria Magli, circa 1907. Gertrude (?) died in 1977. Gertrude (?) had 1 with 1 living in 1910 children. Name Variation Clarisa Jenewein was also known as Claricy. Married Name Her married name was Wieglow. Name Variation Clarisa Jenewein was also known as Clarissy. Clarisa Jenewein married (?) Wieglow. Clarisa Jenewein was born circa 1903 at Wisconsin. Lucinda Jenewein married (?) Weed. Lucinda Jenewein was born circa 1909 at Wisconsin. In September 1930 at Sauk, Wisconsin, 76th birthday celebration. Married Name circa 1886 As of circa 1886,her married name was Bandel. Theresa (?) was born in October 1846 at Germany. She married Joseph Bandel, son of Maurus Bandel and Agnes Brander, circa 1886. Theresa (?) had 3 with 1 living in 1900 children. [S245] U.S. Federal Census 1900 U.S. Federal Census, by Ancestry.com, ED134. Dwelling 65. Robert Gerrish Safford was born on 4 January 1809 at Maine. He married Louisa Boston, daughter of John Boston and Dorcas Moody, on 12 September 1833. Robert Gerrish Safford died on 16 October 1891 at Springfield, Walworth (was Jackson), Wisconsin, at age 82. He was buried after 16 October 1891 at Dunn-Safford-Sherwood Cemetery, Springfield (also reported as Taylor), Jackson, Wisconsin. [S248] U.S. Federal Census 1860 U.S. Federal Census, by Ancestry.com, Page 80. Dwelling 677. Married Name 12 September 1833 As of 12 September 1833,her married name was Safford. Louisa Boston was born on 29 March 1800 at York, Maine. She was the daughter of John Boston and Dorcas Moody. Louisa Boston married Robert Gerrish Safford on 12 September 1833. Louisa Boston died on 28 December 1893 at Springfield, Walworth, Wisconsin, at age 93. She was buried after 28 December 1893 at Dunn-Safford-Sherwood Cemetery, Springfield (also reported as Taylor), Jackson, Wisconsin. Robert Hersey Safford was born on 17 August 1835 at York, Maine. He was the son of Robert Gerrish Safford and Louisa Boston. Robert Hersey Safford married Zerrviah Jenkins on 30 August 1856. Robert Hersey Safford died on 19 January 1919 at Barron, Wisconsin, at age 83. Married Name 21 October 1853 As of 21 October 1853,her married name was Marsh. Mary Abigail Safford was born on 21 February 1837 at York, Maine. She was the daughter of Robert Gerrish Safford and Louisa Boston. Mary Abigail Safford married Charles Herman Marsh on 21 October 1853. Mary Abigail Safford died on 15 January 1873 at Jackson, Wisconsin, at age 35. Married Name Her married name was Dunn. Louisa F. Safford married Patrick R. Dunn. Louisa F. Safford was born on 22 September 1837 at Sparhawk Hall, Kittery Point, York, Maine. Louisa F. Safford died on 5 November 1910 at age 73 Mrs. Louisa F. Dunn, widow of the late Patrick R. Dunn, died on Sunday morning, Nov. 5th, aged seventy-three years. She had been in poor health the past couple of years, suffering greatly of a complication of diseases, of which paralysis of the throat was one of the most aggravating and discomforting. For several weeks she had been in a very weakened condition. The funeral services were held from the home on Wednesday afternoon, Rev. L. E. Hoisington officiating, and were very largely attended. Louisa F. Safford was born at Hickory Point, Maine, in a mansion which had been erected by Sir William Pepperal, of the British nobility, early in the previous century, on September 22d, 1837. She resided there until she was eleven years of age, when she went with her parents to Lynn, Massachusetts, in which city she resided the ensuing eight years." Married Name circa 1929 As of circa 1929,her married name was Anderson. Married Name after 1940 As of after 1940,her married name was Castator. Juanita W. Bowen was born on 19 March 1895 at Wisconsin. She was the daughter of Albert John Bowen and Effie Pearl Sherwood. Juanita W. Bowen married Ray Walter Anderson circa 1929. Juanita W. Bowen married Walter Castator after 1940. Juanita W. Bowen died on 19 March 1974 at Los Angeles, California, at age 79. She was buried after 19 March 1974 at Forest Lawn Memorial Park (Glendale), Glendale, Los Angeles, California, Plot: Sanct. of Refuge, FM, Lot 0, Space 6111. Juanita W. Bowen was a public school teacher in 1930. In 1950 at Voter Registrations, Los Angeles, California. [S245] U.S. Federal Census 1900 U.S. Federal Census, by Ancestry.com, ED133. Dwelling 17. [S244] U.S. Federal Census 1910 U.S. Federal Census, by Ancestry.com, ED85. Dwelling 24. [S243] U.S. Federal Census 1920 U.S. Federal Census, by Ancestry.com, ED217. Dwelling 251. [S373] U.S. Federal Census 1940 U.S. Federal Census, by Ancestry.com, Year: 1940; Census Place: Los Angeles, Los Angeles, California; Roll: T627_405; Page: 1B; Enumeration District: 60-210. William Carpenter was born circa 1852 at Wisconsin. He was the son of William W. Carpenter and Mary Jane Hackett. [S248] U.S. Federal Census 1860 U.S. Federal Census, by Ancestry.com, Page 34. Dwelling 259. [S247] U.S. Federal Census 1870 U.S. Federal Census, by Ancestry.com, Page 8. Dwelling 62. Name Variation Delilah Carpenter was also known as Delila. Delilah Carpenter was born circa 1854 at Wisconsin. She was the daughter of William W. Carpenter and Mary Jane Hackett. Anne Carpenter was born circa 1863 at Wisconsin. Samuel Carpenter was born circa October 1849 at Wisconsin. [S249] U.S. Federal Census 1850 U.S. Federal Census, by Ancestry.com, Dwelling 817. Name Variation Brigitta M. Dischler was also known as Briget. Married Name 19 September 1904 As of 19 September 1904,her married name was Ring. Married Name 1938 As of 1938,her married name was Bindl. Brigitta M. Dischler was born on 7 October 1883 at twin with Gustina, Sauk, Wisconsin, also reported as Oct 1882. Brigitta M. Dischler married John A. Ring, son of Georg Adam Ring and Franziska Roetzer, on 19 September 1904 at Sauk, Wisconsin. Brigitta M. Dischler married Joseph Frances Bindl, son of Michael Bindl and Emilia Weishahn, in 1938 at married to sister Mary's husband, after her death, Plain, Sauk, Wisconsin. Brigitta M. Dischler died on 11 October 1958 at Sauk, Wisconsin, at age 75. Darrell Bindl was born on 15 August 1955. He was the son of Victor Joseph Bindl and Martha M. Ring. Darrell Bindl died on 22 February 2000 at University Hospital at age 44 Darrell Bindl obituary. Leo Luther married Rosie (?). Rosie (?) married Leo Luther. Scott Bindl was born circa 1983. He was the son of Darrell Bindl. Scott Bindl died on 22 May 2004 Scott Bindl, age 21, of McFarland, died unexpectedly from respiratory failure at home on Saturday, May 22, 2004. Scott was a 2002 graduate of McFarland High School and was currently enrolling at Madison Area Technical College. He was employed at the Green Lantern in McFarland. His favorite things in life were simple: being with his family and spending time with his dogs. Scott is survived by his loving mother, Vicki of McFarland; his brothers, Mike, age 25, and Steve, age 24, both of Madison; his sister, Larissa, age 17, at home; grandparents, Martha Bindl of Monona, and Leo and Rosie Luther of Spring Green; many aunts and uncles; and cousins. He will also be missed so much by his awesome canine companion, Brutus. He was preceded in death by his father, Darrell, in 2000; his grandfather, Victor Bindl; and his uncle, Richard Bindl. A Mass of Christian Burial will be held at CHRIST THE KING CATHOLIC CHURCH, 5306 Main St., at 6 p.m. on Tuesday, May 25, 2004, with Father Stephen Smith presiding. Friends may call from 3 p.m. until 6 p.m. on Tuesday at the church. Burial will be at McFarland Cemetery. A special heartfelt thank you to Dr. Ed and Debbie Kramper for 21 years of devoted care to Scott, and to Dr. Chris Green and the pediatric pulmonary team at the UW Hospitals and Clinics. Born with a rare breathing disorder, Scott defied the odds and outlived all expectations. He faced so many challenges in his life but always did so with a quiet strength, never complaining. We will miss his smile and his wry sense of humor. We take consolation in knowing he is at home with his dad. We love you Bud, and will miss you so very much. Welcome home son. His loving arms held open and his heart so full of love. Welcome home son as Jesus stood there glowing. Their hands reached out and touched. I knew that you'd return to me. The place that you were meant to be. Rest now for you've been gone too long. I heard him say as they embraced. I've waited so long for this day. My son, my very own, welcome home. Peter Alois Bindl was born in 1903 at Wisconsin. He was the son of Joseph Frances Bindl and Mary Ann Dischler. Peter Alois Bindl died in 1945. 1 June 1905 Franklin, Sauk, Wisconsin Peter Alois Bindl appeared on the census of 1 June 1905 in the household of Joseph Frances Bindl at Franklin, Sauk, Wisconsin. On 13 November 1942 at U.S. World War II Army Enlistment. Name Variation Gertrude A. Schmitz was also known as Gertie. Married Name 20 June 1939 As of 20 June 1939,her married name was Bindl. Gertrude A. Schmitz was born on 23 November 1916 at Wisconsin. She was the daughter of Peter A. Schmitz and Anna Margaret Bissen. Gertrude A. Schmitz married Walter Jacob Bindl, son of Henry Jacob Bindl and Theresia Kate Dischler, on 20 June 1939. Gertrude A. Schmitz died on 24 April 2007 at age 90 Gertrude A. "Gertie" Bindl, age 90, of Plain, passed away on Tuesday, April 24, 2007, at her residence, surrounded by her family. She was born Nov. 23, 1916, in Bear Valley, Wis., the daughter of Peter and Anna (Bissen) Schmitz. She was married June 20, 1939, to Walter J. Bindl. Gertie was a member of St. Luke's Catholic Church in Plain and worked 23 years at Straka Meats in Plain. Survivors include four children, Judith (John) Moran of Charlotte, N.C., James (Barb) Bindl of Williams Bay, Peter (Tracey) Bindl of Middleton and Joanne (Dale) Ganske of Middleton; 11 grandchildren, Mark (Swati) Moran, Matthew (Kristen) Moran, Patrick (Katy) Moran, Jeff (Sandee) Bindl, Stephen Bindl, Laura Bindl, Brian Bindl, Andy (Lisa) Bindl, Holly Bindl, Neil (Kristi) Jensen and Nathan (Stacy) Jensen; eight great-grandchildren; two brothers, Joe (Catherine) Schmitz of Bear Valley and Erwin (Lindy) Schmitz of Bear Valley; two sisters, Rita Marklein of Spring Green and Anne Ring of Plain; a sister-in-law, Florence Schmitz of Spring Green; nieces; nephews; other relatives and friends. She was preceded in death by her parents, Peter and Anna Schmitz; her husband, Walter Bindl; three brothers, Gregor, Leonard and Francis Schmitz; and two sisters, Eva Schmitz and Zita Nachreiner. A Mass of Christian Burial will be held on Friday, April 27, 2007, at 11 a.m. at ST. LUKE'S CATHOLIC CHURCH in Plain. Father Mike Resop will officiate with burial in the church cemetery. Visitation will be held on Thursday, April 26, 2007, at the RICHARDSON-STAFFORD FUNERAL HOME from 5 p.m. until 8 p.m. and at the church on Friday from 10 a.m. until the time of service. Mom/ Grandma always reminded us many times that our faith and love are forever. In lieu of flowers, memorials may be made to St. Luke's Endowment Fund or Home Health United Hospice. Online condolences available at staffordfuneralhomes.com. Richardson-Stafford Funeral Home Highway 23 South Spring Green (608) 588-2181. [S243] U.S. Federal Census 1920 U.S. Federal Census, by Ancestry.com, ED201. Dwelling 190. [S250] U.S. Federal Census 1930 U.S. Federal Census, by Ancestry.com, ED9. Dwelling 180.